We're checking out of this epic year of 2016. We'll be back in the office from 16 January 2017. In Football United's tenth year, we were absolutely ecstatic when we received the invitation to attend the Streetfootballworld Festival in Lyon in June 2016. France is where the dream all began! We are incredibly moved than I at the generosity of all of you who have helped make so many dreams come true with your generous giving to help us get to Lyon. Here's a recap from the players, youth leaders and staff who made the journey to France. For the eighth consecutive year, Football United's annual Fair Play Festival provided opportunities for hundreds of youth to compete, meet new people and have fun. This year we joined forces with our friends from Creating Chances to deliver the biggest festival to date. On Thursday 1 December, 270 children and youth descended upon Valentine Sports Park. Students from Miller Technology, Fairfield, Lurnea, Evans, Matraville Sports, Arthur Phillip, Liverpool Boys, Airds, Cambridge Park and Prairiewood High Schools joined volunteers to explore a range of team-building activities before they returned to their school colours to represent their schools. In the Girls competition Cambridge Park overcame Fairfield in a tense final. A dominant Arthur Phillip HS took out the Junior Boys competition with a convincing victory over Liverpool Boys HS in the final. An all Miller Technology IEC final saw friends become adversaries, with one team outlasting the other 2-1. We've had a great time in November sharing stories from the first ten years of Football United. On Sunday 13 November long-term partners Sydney FC hosted close to 200 youth, volunteers, staff and friends during their W-League and A-League matches at Allianz Stadium. 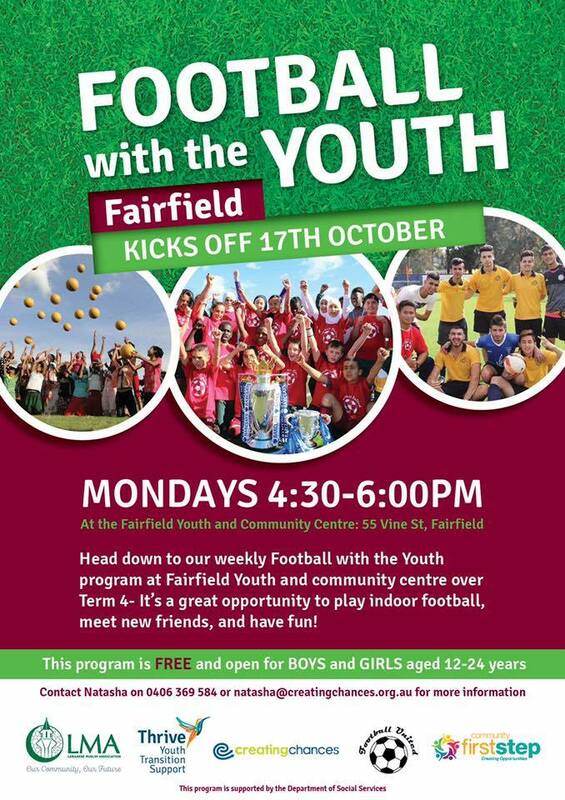 Sydney FC give Football United a shout-out! 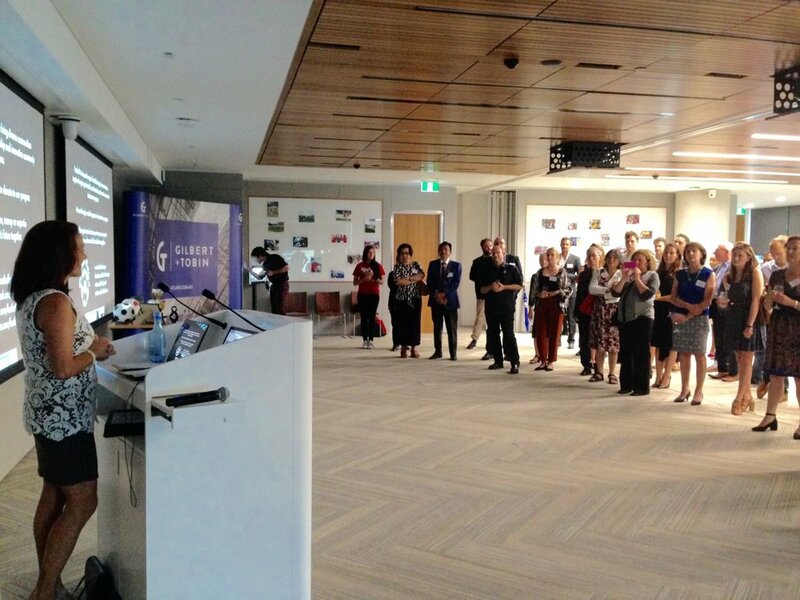 On Wednesday 23 November it was fellow long-term partners Gilbert and Tobin's turn to host our friends as over 100 packed into their new Barangaroo office to acknowledge our impact since 2006. FIFA Executive Committee member and Gilbert and Tobin partner Moya Dodd discussed the importance of football in the world right now, as a tool to heal wounds and bring people together. The team at Football United is extremely grateful to all those who joined us these last few weeks to celebrate our 10th Anniversary. We continue our mission to create chances for children and youth through the magic of football. We are continuously inspired by our supporters, colleagues, teachers, coaches, volunteers, families, and especially the children and youth we work for. Founder Anne Bunde-Birouste introduces Moya Dodd. Director Anne Bunde-Birouste flew to Germany in October to join hundreds of people from around the world who use sport as a tool for social good. Earlier this year Laureus Sport for Good Ambassadors joined youth from our Evans High School program to celebrate Harmony Day. Football United has been a beneficiary of the Laureus Sport for Good program in recent years, and has worked alongside fellow Australian beneficiary - the Cathy Freeman Foundation - to create chances for newly arrived youth and Aboriginal and Torres Straight Islander youth to connect, play sports and learn life skills. 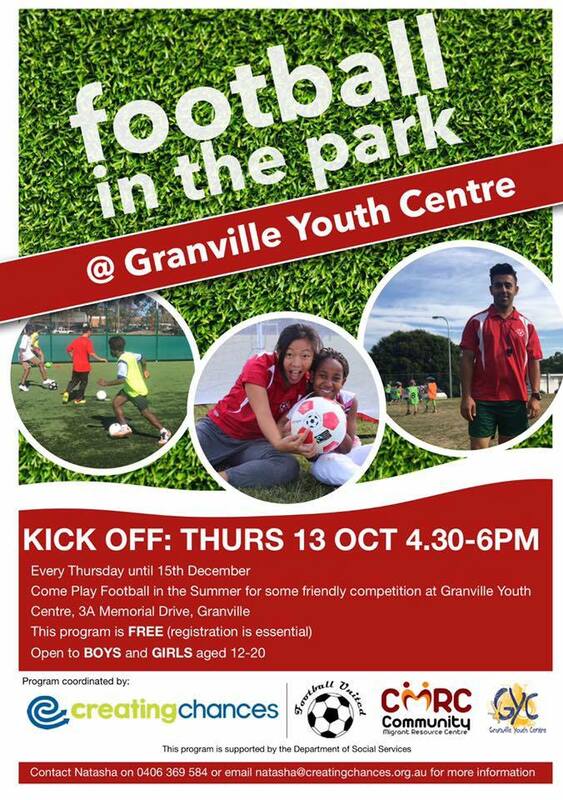 We're excited to launch 4 new community programs this term in partnership with local football clubs and community organisations in Lakemba, Fairfield, Auburn and Granville. Select the image below for more details. These programs are delivered by Creating Chances and supported by LMA's Thrive program and CMRC's Youth Transitions Program. In June and July our team from Football United joined scores of others from all over the world in Lyon at Streetfootballworld's magnificent Festival 16. The Football United team, representing Australia, is made up of students from Cambridge Park HS, Evans HS and Granville South HS. Margie Andreasson and Karam Alkhamasy led the group, with Alhassan Diallo and Theo Birouste joining as Festival 16 volunteers. Director Anne Bunde-Birouste joined the team to launch the festival song, an adapted version of Football United's Field of Dreams, written in 2012 by Michael McGlynn and his team from Vienna People. Football United's Community Coordinator Assmaah Helal, looks at the world of Sport for Development and Peace to celebrate the achievements of women and #pledgeforparity. Football embraces equal participation opportunities for males and females. But in most cases the environment is dominated by male coaches, male managers and male role models. Female coaches, administrators and role models are vital components for ongoing participation and increasing equality. TheWomensGame’s recent report, “Girls football participation hits all-time high”, highlights the reasons for increased participation of football for girls from minority groups and migrant communities, and makes specific reference to Football United’s role in this achievement. Football United is able to address this gender bias and provides access to coaching qualifications and opportunities to use these skills within their community. Over 40% of Football United coaches are female. The gender balanced environment provided by Football United not only increases short term participation amongst females but also the long term opportunities to grow and diversify the volunteer and paid workforce available to Football in Australia. SAFE SPACES: Providing culturally appropriate sporting activities and environments for girls and their families, particularly from refugee and migrant backgrounds to participate comfortably. i.e. girls only spaces, creating a safe space, building positive relationships with families and schools, providing inspiring female role models from within the community to coach. ROLE MODELS: Build the capacity of young women from diverse communities with the skills required to navigate life effectively and contribute to the wider Australian community as agents of positive social change i.e. through coach education, advocacy training, mentoring and leadership camps and forums. To celebrate International Women’s Day, Football United facilitates an annual Strong Women. Strong World forum inviting program participants and inspiring female leaders identified through corporate and community partners from various professions to share stories, challenges, and provide an opportunity to network and engage in capacity building activities. What more can you do to leverage sport to consistently provide equal opportunities for women and girls? Football United partnered up with Australiance to bring the 2016 Corporate #EuroCup to life! Saturday 5 March saw teams congregate from across Sydney to compete in a fun, vibrant tournament with an emphasis on fair play and underpinned by a real sense of purpose and giving. Team Brazil edged the final with a high quality final edged on penalties over Team X. Proceeds of the tournament will support the Football United participants who will make their way to Lyon, France to represent Australia in Festival16, to be held during the European Championships in early July.